This is our Spring Festival Concert at the great venue we used in 2017. 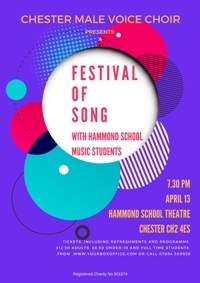 We will again showcase Hammond Music Students as we did including the brilliant Beau Dermott 2 years ago. Our programme includes significant number of new entertaining pieces all fitting the theme of LOVE. Seating at the venue is tiered and all seats are numbered. 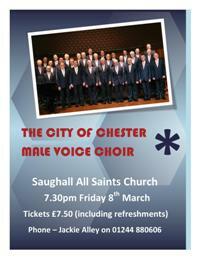 They are on sale now from www.yourboxoffice.co.uk. 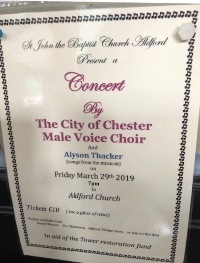 Ticket prices which include interval refreshments and concert programme are £12.50 for Adults and £8.50 for Under 18 and Full Time Students with no additional booking fee. The venue has excellent on-site parking facilities. We are pleased to be supporting a worthy cause. 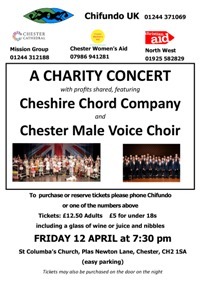 We will share the stage with the brilliant Cheshire Chord Company. We are pleased to be supporting the church in the raising of much needed funds for the Church Tower restoration. 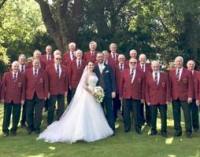 We are pleased to have been booked to sing for our first wedding of the year. We all enjoy bringing something special to these joyous occasions. 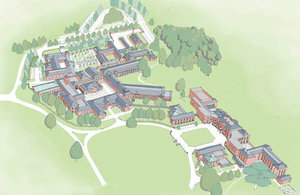 We are proud to have been asked by our President, Her Grace The Duchess of Westminster to contribute to an invitation event aimed at raising funds for the maintenance of this facility which his Grace the sixth Duke of Westminster was so passionate about bringing to fruition.